Well here we are only two weeks into Fall and I've already gone and caught a cold. I'm usually the last one in my family to come down with it but this year it was me who took the fall first. I suppose it was only a matter of time. As soon as school starts back up, all sorts of contagious ailments start making their rounds. I haven't had much of an appetite and the only thing that sounded good to me was soup so I made some. I didn't want to make a trip to the store so I used what I found in the refrigerator and freezer. It's a little on the skimpy side with only the basics but the broth was good which was basically all I wanted. 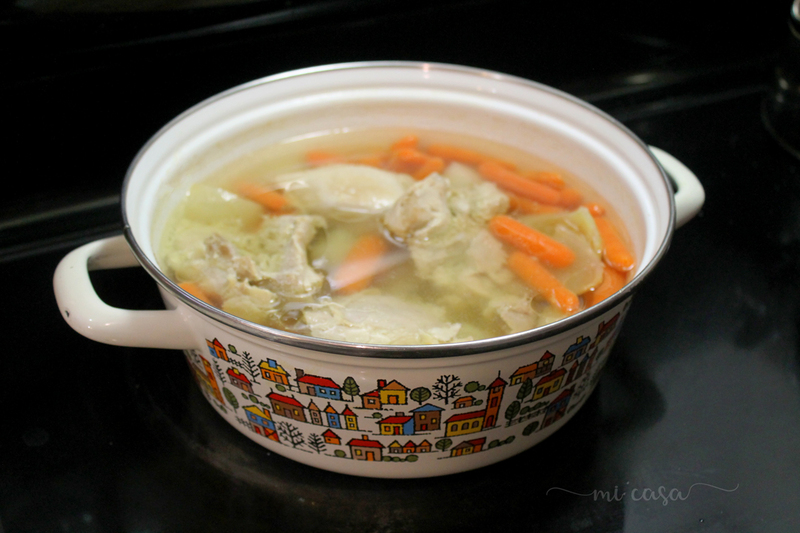 There's something so comforting about chicken soup. While my soup simmered I made pumpkin bread. It's the first pumpkin-y thing of the season and it was oh so good. Do y'all remember Mrs. Roper from Three's Company? She was the Muu-Muu queen. Well that's what I've felt like these last few days, the muu-muu queen. It being gloomy and drizzly outside and having a cold are the perfect excuse for me to sport my pretty prints around the house. I've been trying to add some rows to this baby blanket I started long ago. Even though I keep knitting rows and rows it grows at a snails pace. I think I'm finally reaching the halfway point though, thank goodness. And oh yeah...it's post season baseball time! 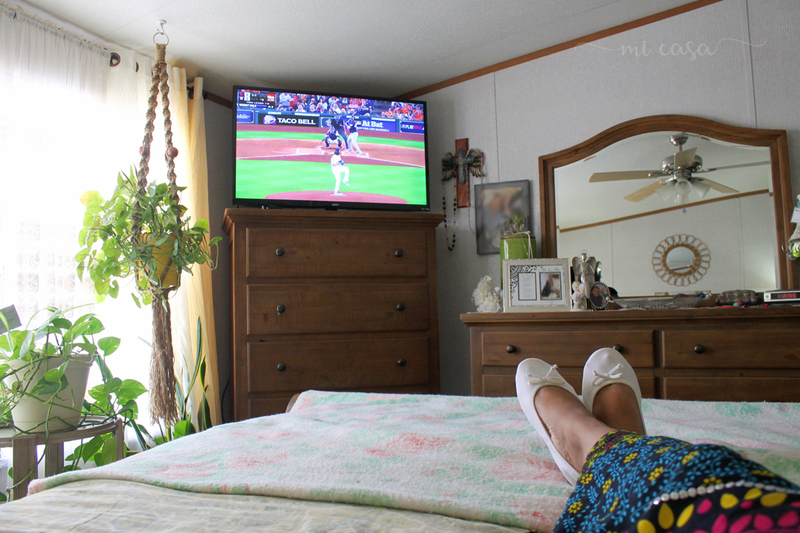 Yes, I admit, I am a muu-muu wearing, baseball lovin' boho mama. enjoyable even with the sniffles. Hi Beca, oh I am so sorry to hear that you have a cold. I do hope you feel better soon. Yes, it's that time of year and I got my flu shot already. Rest up and take care. My kids have been passing one back and forth for weeks. I totally remember Mrs. Roper!!! And I loved her wardrobe! You look great, and I think I will find some and do the same. 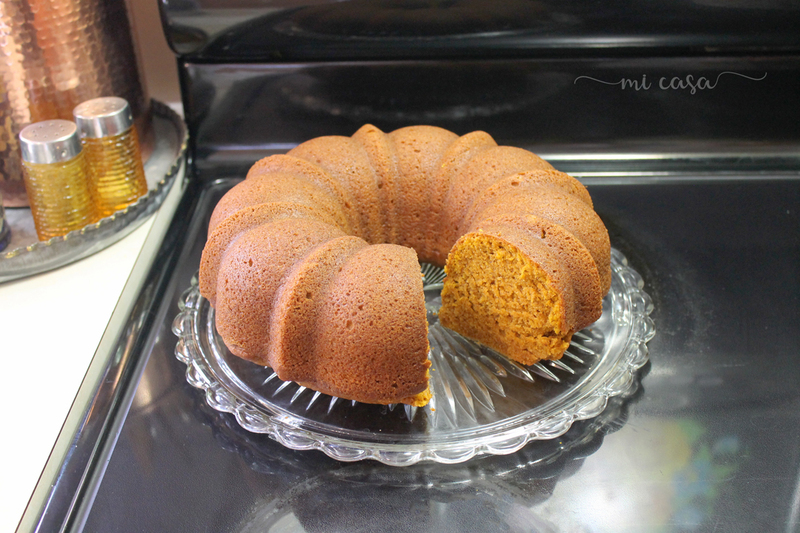 That pumpkin bread looks DIVINE!!!! Oh dear Beca! so sorry to hear that you are down with cold. Hope you'll be absolutely fine in no time. This delicious soup will surely help you..
Hope you are feeling better. 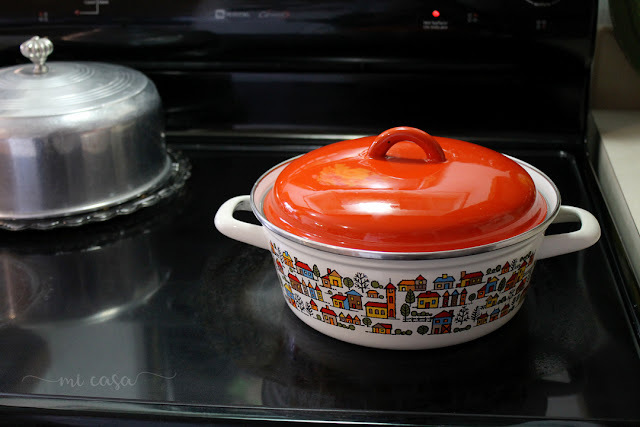 The chicken soup and that delightful looking pumpkin bread is sure to help. 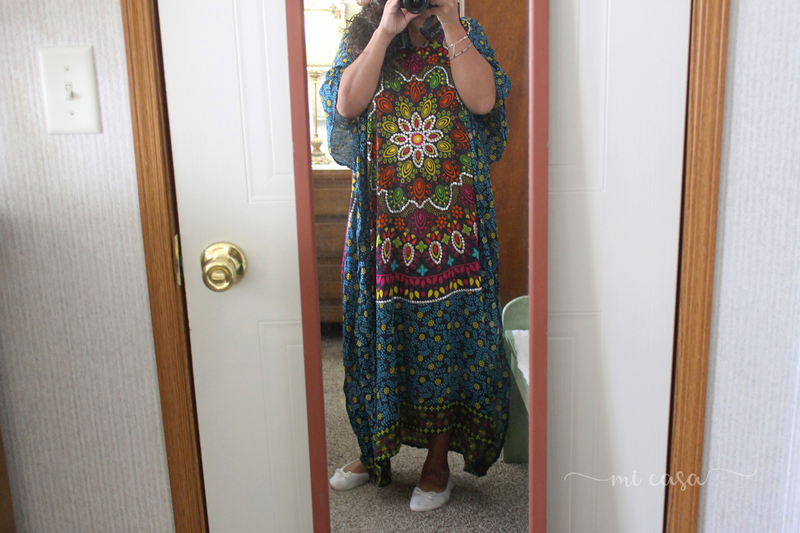 Love the kaftan, the perfect outfit for lounging. Hi Beca, so nice to meet you. 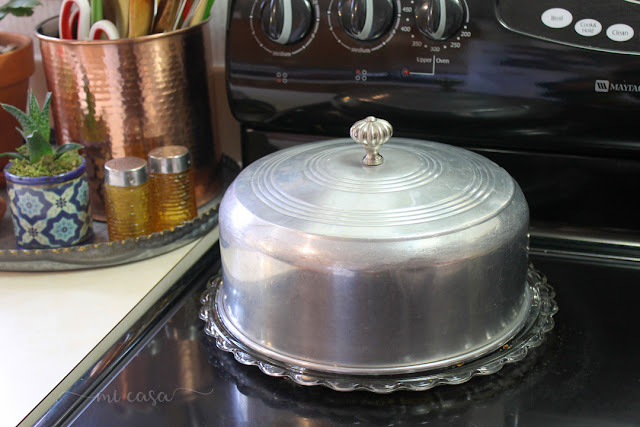 I am blog hopping from Teri's place. I enjoyed my visit. I love color too! I started Bible journaling two years ago and it has really opened my eyes up to color and the Word. I hope you can stop and visit my web home. I hope you feel better soon! Ha! Mrs. Roper! I like your muu muu. I'm so sorry that you have a cold. Boo. Stay warm. I made some similar weak chicken soup. It was okay, sometimes it's not salty enough. I'm usually not a "salt everything" person, but I guess maybe I should measure. Beca, I have not heard that Muu-Muu term in so long. LOL. I actually had one when I was pregnant for my fist daughter. When we don't feel well, we don't need to really get dressed. Good that you made yourself some soup. There's too many germs around...everywhere. Yes, it seems the start of school brings out the germs . Blessings to you, take care and get well. Hi Becca. I'm so glad you visited my blog. Thank you for visiting, commenting, and subscribing! (I'm your newest subscriber!) We have quite a bit in common I think. We both have the sniffles! We both like muu muus. And I am originally from NM. Born in Santa Fe way back when. Colds are no bueno -- especially -- well, especially anytime! Feel better! I hope by the time you read this that you are feeling much better. 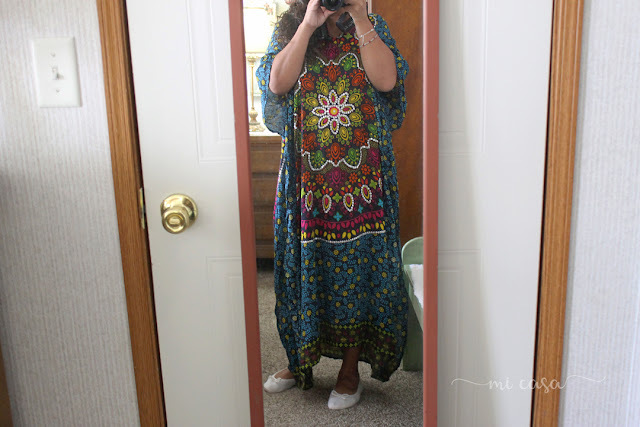 You look adorable in your boho caftan; I love the colors. Chicken soup . . . the cure-all for colds, flu and the blues. As you are sorted with soup and bread, I'll send you a virtual cup of lemon-ginger tea. Really good for fighting a cold. Enjoy the baseball. soup, the perfect remedy for a cold and yours looks delicious!! the hubs is just getting over a cold and i made chicken noodle soup for him, it was the cure!! 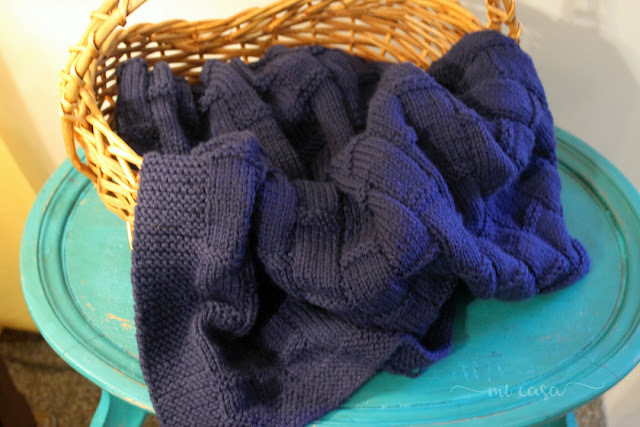 and there's "your" blanket, that's a pretty pattern and a beautiful color!!! I agree with you: There's something comforting about chicken soup.It is always a sort of 'penicillin' for my cold.